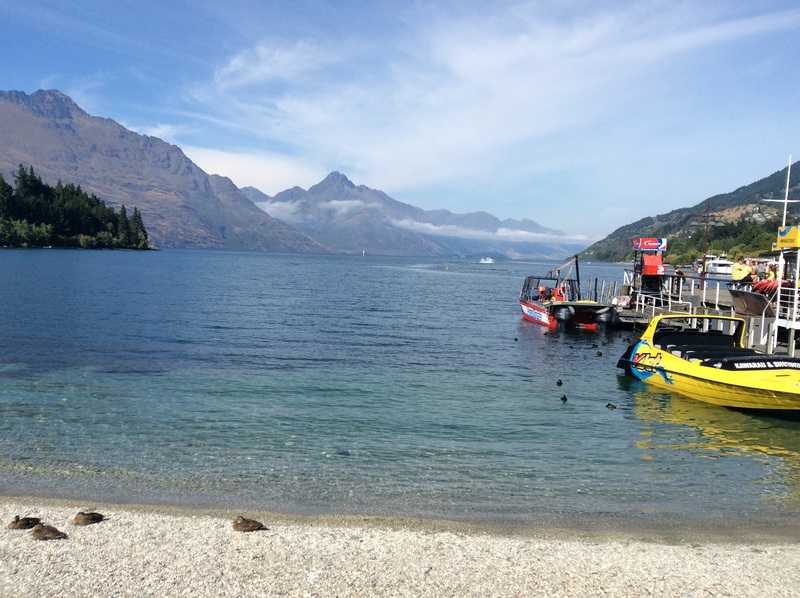 Queenstown is a small resort town of perhaps 30,000. The heart of the place is a merchant district with shops, restaurants, bars, all very expensive. I needed some socks, as I forgot to pack more than wool hikers, and I will not divulge how much I paid for two pair other than to say that it is comparable to a tank of gas right now in the states. I also wondered where they buy their toilet paper, and we discovered a grocery store this morning that sells such basics, outside the tourist district. There is a tram up a steep hillside to a restaurant, and hang gliders and a bird refuge up there. It is $45 to take the tram, and an all-day pass to the kiwi reserve is $65 or so. So we are just walking about enjoying the free parks and stuff, waiting to meet our group tonight and head out on Milford tomorrrow. There will be no Internet for five days, always a cleansing experience. We know nothing of the other 19 people in our group, but have found in the past that hiking groups are generally lively and interesting. Next Next post: The Americanization of the French mind?